Completed Doris Kearns Goodwin's Team of Rivals today; was absorbed in this American Civil War saga for the past two weeks. Terrific story! Terrific writing! My respect for and admiration of Abraham Lincoln has increased leaps and bounds. 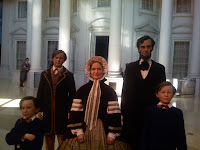 My interest in Civil War history and in Abraham Lincoln's life was born during the cross-country road trip I went on last year with Jonathan Hoffman. Jon is a Civil War buff, and had got two related audio books with him for the road trip - one about Civil War (I don't remember the author) and another James L Swanson's book Manhunt : The twelve day hunt for Lincoln's killer. Both books were amazing - providing me insights into that part of the history which I had only known as a 2-3 line paragraph in the World History textbooks. As part of the road trip, we had visited Springfield, IL - where Lincoln spent most of his adult life, and Vicksburg, MS - the scene of one of the most celebrated Union victories during the Civil War. Very recently I visited Gettysburg, PA - the scene of another major Union victory and the site of Lincoln's most celebrated speech - The Gettysburg Address- a speech lasting just over two minutes!